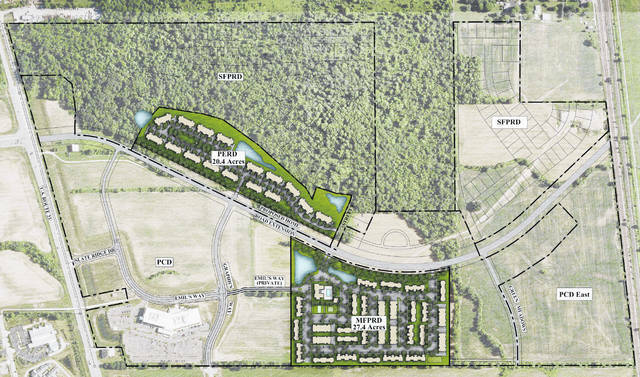 Pictured is a rendering of the Schottenstein Real Estate Group’s planned development along the upcoming Home Road extension east of U.S. Route 23. In the rendering, U.S. Route 23 is shown to the left, and the Home Road extension is pictured running west to east between the proposed development sites. In a unanimous vote Monday, the Orange Township Board of Trustees approved a zoning measure that will allow for the proposed construction of a development that will combine 300 units of multi-family housing with single-family housing, a senior-care facility and commerce (retail, office and industrial). The trustees’ approval of the zoning measure was also the final piece needed to start construction on the Home Road extension east of U.S. Route 23. During its March 14 session, the Delaware County Board of Commissioners approved a development agreement with the Schottenstein Real Estate Group and the Kerbler family, who owns 300 acres of property next to Mount Carmel Lewis Center, 7100 Graphics Way, and the Creekside Industrial Park located east of U.S. 23. Don Hunter, Schottenstein Real Estate Group senior vice president, said partnering and cooperation were key to the project coming to fruition. The Home Road extension will cross U.S. 23, connecting it to Green Meadows Drive and Graphics Way. It is the first phase of a larger project that will create another east-west connector in the county. Delaware County Engineer Chris Bauserman projects the cost of the first phase of the road extension project will be $10 million, for which $5.75 million will come from the developer, tax increment financing (TIF), special assessments, and dedication of right-of-way. According to county officials, financing was made possible by working with the Delaware County Finance Authority, Orange Township and Olentangy Local Schools. The county also negotiated a TIF agreement with the project developers in December. The county said the TIF is projected to generate approximately $36.7 million in revenues to support infrastructure improvements and the local schools. According to the commissioners’ March 14 journal, the Schottenstein Real Estate Group proposes to build approximately a 288-unit multi-family, rental apartment facility with a minimum of four units per building, and a patio rental home development consisting of approximately 68 units with a minimum of four units per building. The project is projected to create employment opportunities that will add to the commerce of the county. Hunter said the other end of the spectrum are people in their mid- to late-50s who are already in the area or coming to the area to join other family members. Hunter said the apartments will start at $1,000 a month and possibly go as high as $1,800 for the young professional demographic. He said the impact to the local school district would be no more than 10-14 children, while adding significant tax revenues to the district. This entry was tagged D. Anthony Botkin, Delaware County Commissioners, Delaware County Engineer Chris Bauserman, Home Road extension, Kerbler, Orange Township, Schottenstein Real Estate Group. Bookmark the permalink.